Very nice for the first try. The coloring is well done, but still it lacks some tiny details on the rose. This really a is a great first try! I also agree that the rose would look better if more elaborate but still.. There haven't been any recent Blood + walls. It's a new subject and I love the fact that it is not just a regular Blood + image, it's more fresh and original. I love the blue shades and it presents a great Saya image. And she is my fav character from this anime. I love the clean lines, the light, her eyes and the wonderful blue shades. Great work! the wall is brilliant,man the vector is awesome! Simply wow, his has to be my next wallpaper... like now! cheers. i like the moonlight. it really looks good with the blue rose. It's so lovely. 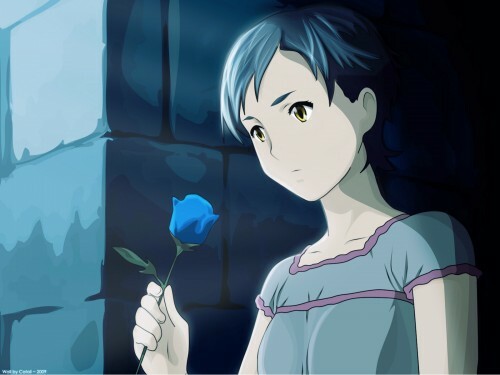 Saya looks so beautiful with a Blue rose. Its reallly Beautiful ...xD !